If You Solve THIS Soviet Kids Puzzle Your Intelligence Is Far Greater Than 99% Of The Internet! An obscure cartoon riddle has resurfaced on the Internet, causing a lot of people to scratch their heads. 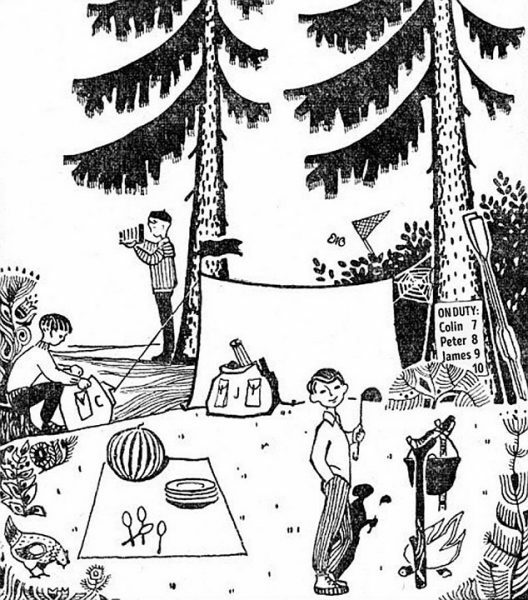 The puzzle is from a Soviet-era book by E. M. Minskin called “Vsegda vsem veselo: Sbornik igr i razvlecheniy.” which in translation would mean something like “Everybody Happy Everywhere: A Collection of Games and Puzzles” – don’t keep me by the word. This puzzle is aimed for kids, however, it’s fiendishly hard. The trick seems to be to pick up on every little clue in the picture and then apply every ounce of your logic and knowledge. And even then, it’s pretty impressive if you manage to actually get any of the answers. In other words, you need to become Sherlock Holmes. Here is the image. Look at the questions below and try to find clues in the image so you can answer them. 9 of 9 is LEVEL SHERLOCK! WARNING! DON’T SCROLL IF YOU DON’T WANT TO SEE THE ANSWERS! Four. One name is concealed behind the bush on the “On Duty’” board. There are also four spoons and four plates. A few days ago, judging by the spider web between the tent and the tree. By boat. There are oars resting against a tree on the right. No, although the chicken wandering suggests it is near a village. South. Tree branches in the Northern Hemisphere tend to be bigger on the south side. The flag on top of the tent suggests the wind is blowing from the side of the bigger branches. Morning. Using the answer from question five, we can work out east and west. From the shadows, we can see where the sun is and conclude that it’s morning. He’s catching butterflies. You can see his net behind the tent. Colin. Peter is cooking and James – shown by the J on his bag – is taking photos. According to the duty list, Colin was therefore on duty yesterday. August 8. The number next to Peter’s name is 8 and he is the person on duty. The watermelon, which ripen in August, suggests it’s August.